If you enjoy spending time outside in your backyard, chances are that you also like to share that space with family and friends. You may have a set of patio chairs to relax in, but you may not have enough for everybody. You may think to pull out your camping chairs or beach chairs, but those may not be comfortable for everyone. Inflatable chairs are a great comfortable alternative that you can have to provide all your guests with a comfortable seat. 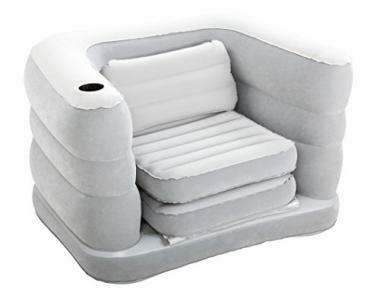 Inflatable chairs are convenient because they can collapse into a fraction of their size for easy storage. They are also versatile and can be placed in any location in your backyard. Inflatable chairs are also comfortable. It can be hard to choose which inflatable chair to purchase because there are so many different designs and types. Some inflatable chairs are similar to inflatable loungers and others truly resemble your other outdoor patio furniture. 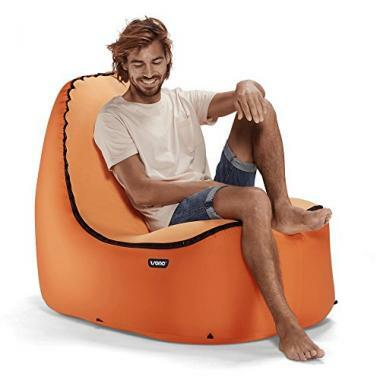 This inflatable chair has a pull-out design that allows it to expand into the size of a twin sized bed. It is safe for use both inside and outside. It has a comfortable backrest and armrests. The entire bed folds into a compact size for easy storage. You can easily switch from a chair to the twin sized airbed. It is ideal for college dorms, guests bedrooms, and even for use on the road. It has a 2-in-1 valve that has an extra-wide opening for fast inflating and deflating. It has a 300 pound weight capacity. Intex ensures their design is comfortable, as well as versatile. This inflatable chair has an empire design that is perfect for living rooms, college dorms, backyards, and patios. It can be easily placed on a patio, deck, or lawn. It is made of durable 2-ply with a reinforced bottom. It has a modern trim, contoured seat, and waterproof-flocked surface. A combo valve has an extra wide opening to ensure fast inflating and deflating. Intex built this chair to have a perfect combination of form and function. Their inflatable chair is modern, sophisticated, and endlessly comfortable, so that you can use it throughout the years. This inflatable chair has a design that is perfect for being portable. It can be easily used on road trips to keep you comfortable. You can also use it around your house because it is suitable for indoor and outdoor use. For just about any location that you need a chair, this inflatable design can be there for you. It has a 250 pound weight capacity. It inflates in minutes, as well as deflates quickly. The chair can be easily stored to save space or for when it is not in use. It is also available in four different colors, so you can choose what best suits you. This Multi-Max Inflatable Air Chair has a multi-functional use. It can be used as a chair or expanded into a bed. It has flocked surfaces and sides, as well as a sturdy I-beam construction. It is super comfortable with a backrest, armrests, cup holder, and pillow. It folds compactly for storage or travel and is perfect for lounging or an overnight stay. 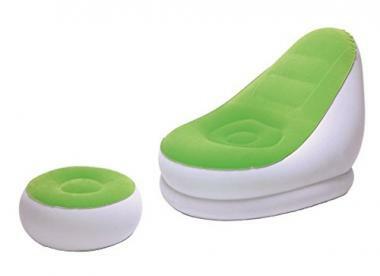 This inflatable chair takes the classic design of a beanbag chair and eliminates the mess of the filling beads. 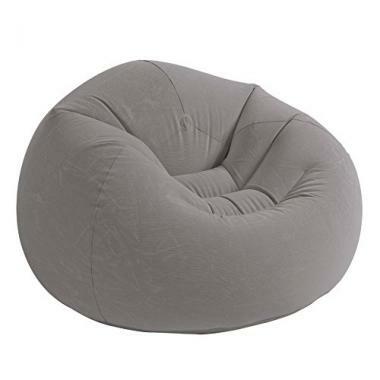 This inflatable bean bag chair has 15 gauge vinyl sides and bottom. It has a neutral color and corduroy texture. It inflates quickly and can be deflated when more space is needed. If you ever experience any punctures or small holes, you can easily patch them with a repair kit. You can place this design anywhere both indoors and outdoors. Intex ensures their design will add an elegant and luxurious look to any room. This inflatable chair is made of plastic. It has a comfortable seat with armrests and backrests. It is safe for use with kids and can be used in a variety of locations. You manually blow up this design and it has a weight capacity of about 200 pounds. Trono ensures that they have a revolutionary inflatable chair design that beats them all. This is an inflatable outdoor blow up hammock design. It is compact and has commercial grade parachute material with durable double stitching. A suede seat cover keeps you comfortable. It is easy to blow up in seconds and weighs only 1.7 pounds. It can be easily taken on any trip to any location. Its foldable size can be fit into a small backpack and carried with you. It has a weight capacity of 350 pounds. This design has unrivaled back support with an adjustable seat back angle, seat pad, and protective bottom pad. With Trono, you can relax in comfort. They also include their 2 Year Warranty. This inflatable chair design is comfortable and sturdy. 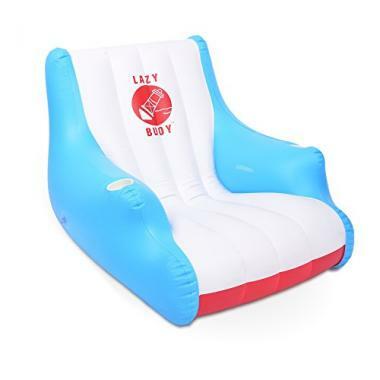 This is a floating chair that can be used in the yard or the pool. It is easy to get on and off. It has two cup holders that are built-in and holds drinks of all sizes. It has a quick-inflate that has a unique new valve. With GoFloats you can have fun in the sun. You’ll stay safe with the tether attachments that you can clip to anchor yourself. This is a portable and versatile inflatable chair design. 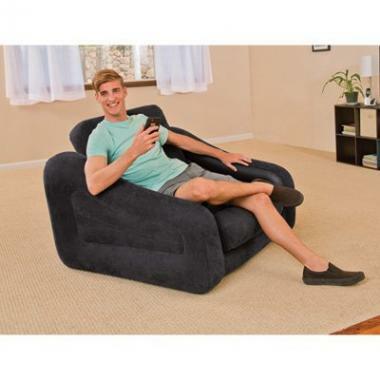 It has a footrest and comfortable flocked surface. It can be used both indoors and outdoors. It has a 2 air chamber construction. It is great for camping or temporary guests. This air chair has a comfortable and flocked surface. It has a sturdy I-beam construction with 3 chambers. It is specially designed for both indoor and outdoor use. It has a cupholder included in the design. It provides a superior level of lumbar support for maximum comfort. There are a lot of different designs for inflatable chairs, which can make it hard to choose which chair or chairs you want. Even if you don’t mind having a variety of designs for guests to use and choose from, it can still be difficult to determine which ones are the best inflatable chair designs. There are a few different features that can help you determine which inflatable chair might best suit your needs. 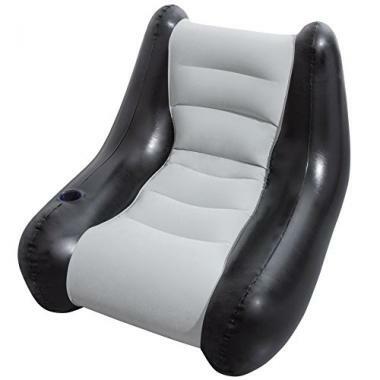 By considering a few features, you can narrow down your search to find the best inflatable armchair. Durability is important for inflatable seats because it would be frustrating to have a chair break on the first use. Inflatable chairs are also not the same as other outdoor chairs because they can be placed directly on the ground in essentially, any location. So, if there’s a few small rocks underneath, the inflatable furniture shouldn’t puncture and deflate. Inflatable chairs also have to be able to support the weight of a person. For those reasons, a durable blow up chair will do the best in serving your needs, as well as being long-lasting. Durable air furniture will also be the best at withstanding various weather conditions. While you don’t want to leave your inflatable seating out all the time, you do want to ensure that if a sudden rainstorm comes up, it won’t damage your air chair. The best way to ensure your air furniture is durable is to look at the materials. The actual material of the chair may be a mix of fabric and plastic, but both materials should be overall sturdy enough to hold both the air and the weight. You should look at the materials listed on the box or product information before you make a purchase. Inflatable chair reviews are also an excellent way to determine if a design is long-lasting. Inflatable chair reviews can tell you exactly how the chair has withstood the ways it is used and for how long it has lasted. They can also tell you more about the specific design and features. It is very important that you consider how much your inflatable chair for adults can support in terms of weight capacity. The average air chair can hold about 250-300 pounds of weight, but you may find designs that can hold up to 750 pounds of weight. The brand should provide information about the design of the chair, which states the maximum capacity that the chair can support. Look for any information on the packaging, box, or user’s manual. The higher the weight capacity that air furniture can support, the slower the air chair will leak air. Air leaking is natural with all designs of air furniture, so you shouldn’t be worried about a true leak. Over time, you chair will eventually loose little amount of air because of the pressure from the weight of the person. If you use your chair for hours, you may have to blow it up again to keep it comfortable. Most inflatable furniture won’t be flexible once it is fully inflated. There may be a few features like arm rests or head pillows that can be moved and adjusted, but the actual body of the air chair shouldn’t really be flexible. A portable inflatable chair will be flexible when it is deflated because it can be easily folded up and stored away. However, you may feel a slight flex, when you sit in your chair. As your weight applied pressure, you air chair may bend and move slightly to accommodate you. This is normal, as it does need a little flexibility to be comfortable. You chair may come with or have a few accessories available for purchase. There may be inflatable pillows that are similar to camping pillows, cup holders, or even footrests. You may also find your own accessories like blankets, that can be safely used with your air furniture. It will be up to your personal choice to decide how many or how few accessories you want your inflatable seating to have. A portable inflatable chair may not come with the options you want, because it is meant to be more compact and easily maneuvered. The design of your blow up chair should state whether it comes with accessories or if they are available for purchase, as well as feature a photo with some accessories, so you can see how they function. There are many, many different shapes available for purchase. Some designs have a shape that truly resembles an air chair and other designs are similar to an inflatable lounger. Some designs don’t have a shape that resembles any kind of recognizable furniture. Like accessories, the shape of your inflatable seats will be up to personal choice. With all the different shapes available, you should be able to find a design that you enjoy and feels comfortable for your body. 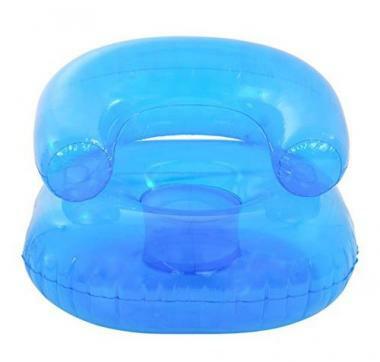 Q: Can I use my inflatable chair in my living room besides the pool/beach? A: Yes. Air furniture is extremely versatile and can be safely placed on any flat surface. A top rated inflatable armchair can be used both indoors and outdoors, while still keeping you comfortable. If you do choose to use your inflatable furniture indoors, you should check to make sure that they don’t track in any dirt or debris from being used outside. You can easily rinse off and dry your furniture as you switch from use indoors and outdoors. Q: What to do if my inflatable chair has a hole in it? Can it be fixed somehow? A: Most inflatable furniture can be fixed if there is a small hole or tear with a repair kit. A repair kit may be included in the purchase of your air furniture. If there isn’t a repair kit included, most brands will have a repair kit included for separate purchase as an accessory. A repair kit should come with all the pieces you need to repair small holes or tears. If you have a large puncture, you likely won’t be able to repair your air chair. If a hole is too large, even a repair can change how it supports weight and what capacity it can hold. It is then best to replace the entire blow up chair, rather than try to repair it. Q: How to care for an inflatable chair? A: Most inflatable chairs have easy care and maintenance. There should be care and maintenance instructions provided in the user’s information or guide, that have specific information regarding your specific air chair design. However, the care and maintenance for air furniture is also rather universal. You should ensure that all inflatable furniture is fully dry before it is deflated and stored away. You can also easily clean your air furniture with water, mild soap, and a soft sponge. You may find that even just a quick rinse with the hose is good enough to clean it up. Another way to care for your inflatable seating is to ensure that it is always stored out of sunlight. The sun has harsh rays and over time it can degrade and breakdown the plastic of your inflatable chair. When it comes to a top rated inflatable armchair, you want the best of the best. Comfort is important for you and your guests. The best inflatable chair will have you relaxing by the pool, in the garden, on your lawn, or on your porch. The versatility of inflatable furniture means that you’ll always have a comfortable seat for everyone. 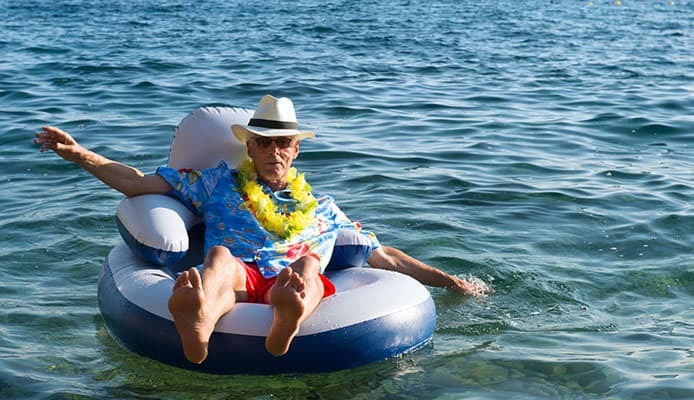 If you know exactly what you need and want, you can save time and money by investing in the best inflatable armchair. 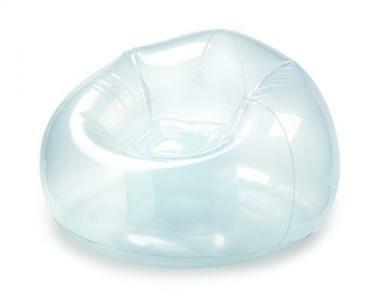 Do you own one of the inflatable chairs that made it onto our list? Let us know how it has worked for your outdoor needs in the comments section below.